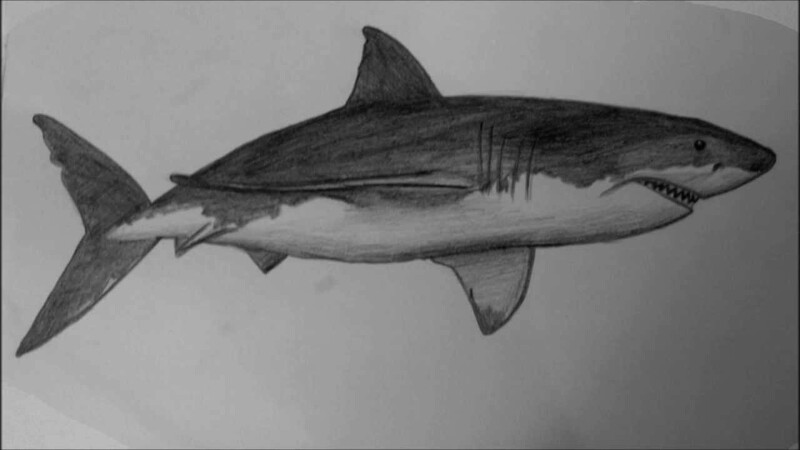 We are going to learn how to draw a shark easily and step by step in this video tutorial we have prepared for you. This video tutorial is really simple and anyone can do it without any extra effort. Watch this easy step by step video tutorial and do share it with your friends. Let’s tell you kids some useful and to the point everyone-should-know info about sharks. Sharks, as we know that are on the list of apex predator and reside on the top of food chain. There are many types of sharks approximately 465 known species of sharks existed on this planet or known to humans. They are declining in number due to natural hazards and many other factors. Sharks have a cartilage skeleton, a tissue less hard than bones and a series of 7 to 8 gills. They have multiple set of really sharp teeth through which they can hunt fish, crustaceans, mollusks, marine mammals and other sharks too. They have very slow reproductive system so it will take a while to recover their declining rate of reproduction. We all have heard the name of the deadly great white shark, so we must have this in mind that these species do not hesitate in killing any kind of thing possessing blood in its body. They have a great sense of smell so they can sense smell of blood from several miles. Sharks mostly attack their prey silently and hunt them by giving them a surprise. They have different type of species that can live in any part of the world and in any type of water. So, let’s watch the video and then try to do it on your own but on the see-twice terms and basis only. You must watch twice before trying it on your own. This is an expert advice for you. Share this tutorial on facebook, twitter or Google plus. You have the choice to make. visit our site daily for more education.